Somewhat reluctantly I went back to Harriman State Park to try once again on completing a 110 mile bike ride. Today should have been a nice recovery day and I was looking forward to spending the time lounging about with my children. I figured maybe we could go to the Red Hook Municipal pool and spend the day splashing and playing in the sun. However, that was not what I did. Instead I woke up at 4am to get an early start up to HSP and hopefully finish my ride early enough to still go out with my kids. When I started on my first loop, the familiar doubts about whether I could do this creeped in. I just reminded myself that I always feel this way on the first loop and to give it some time. Sure enough I started to feel better after the first major climb and settled into a decent rhythm. The first loop took me 49:28. I didn’t stop after the first loop and was happy to see a slightly faster time for my second. On my second loop I was treated to the sights of several wild turkeys running about a several deer. Most interesting, was a snake I almost ran over on the climb up to Tiorati. I decided to snap a photo of him and chase him out of the road before a car came and squished him. 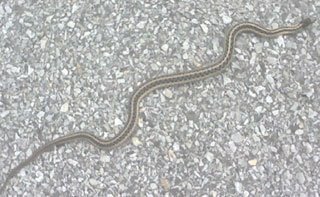 It was cool to watch him slither out of the road. I also set the downhill speed PR of the day, clocking in at 49.6 mp. For some reason I can never break 50 mph going down this hill; must be terminal velocity. The third and fourth loops peeled off rather quickly and both were under 48 minutes. I was very happy with my pace so far. By this time of day it was getting very warm and was drinking a lot of water. Stupidly, on the fifth loop I decided not to fill my water bottle. I went out with half a bottle and it looked like I may need more. It was a dumb mistake as the thirst was really starting to set in. I’d have enough for the loop, but not as much as I would have liked. The fifth loop also gave me a pretty bad scare during the big descent. I was flying down it at over 40 mph when I startled a deer. It made to jump out right in front of me and only at the last second changed its direction. It was so close, that if I wasn’t dehydrated I am sure I would have pissed my pants. By the time I hit my 6th and 7th loops the temperature was up in the 90’s. I was downing over a liter of water per loop and started to battle a slight case nausea. The only way to combat this was to slow my pace a bit and allow my digestion to catch up with my fluid intake. I was also downing an Endurolyte every 20 minutes; chewing actually as I decided that having one get enlarged in my trachea during an earlier attempt at swallowing one while riding wasn’t working for me. I finished these two loops in 50:32 and 53:39 respectively. The completion of my 7th loop meant I only had 12 miles to go. I stopped once again at the water fountain to cool myself and recover. I wasn’t sure if I would do a 6 mile out and back or make my suffering last by going the full 14 miles to make it an even 8 loops. I guess I really knew what I was going to do when my odometer ticked 104, signaling the turn around point. I continued on for the complete loop, figuring in for a penny, in for a pound. I was actually stronger on this loop that the previous and very glad I did it. I guess I am ready for IMLP. Did you get to go to the pool with your kids? Are you taking them to see fireworks tonight?